There seems to be a disturbing trend happening on the amazing collective consciousness we call the internet. 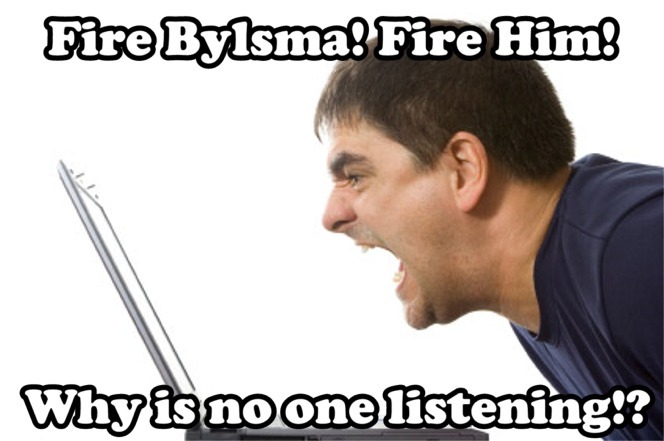 Calling for the immediate termination of Pittsburgh Penguins head coach, Dan Bylsma. Now this curious movement is coming from the most educated corners of twitter, Facebook, and other social media. Right now there is a small subculture of Penguins "fans" who are fervently calling for the head of Head Coach Dan Bylsma. They want him gone, no questions asked. They want to see his resignation in the Trib, framed, with bold letters. I don't understand this undying need to shake up a first place team. As of 3/02/13 here are the standings in the entire NHL. That's 5th place in the NHL. Let's take a look at the Eastern Conference shall we? I'm assuming that the people who are calling for the resignation of a winning head coach in the middle of a season are new to NHL hockey, I'll explain ...the Top 8 teams go to the playoffs this year. The Penguins are in 2nd place (as of 3/02/13) that means, if the playoffs were to start today the Penguins would be able to participate due to us being first place in our Division. See? That's us in first place. The Penguins are second in goals scored in the entire NHL. That's out of 30 teams! The Penguins have the third best Powerplay in the entire NHL. That's out of 30 teams! Before you change your minds, I have to point out that this pattern of success isn't only relegated to this season, it's been a trend since 2009. In fact, only one other active NHL coach has had more success. Todd McLellan with the highest career winning percentage has yet to win a Stanley Cup or a Jack Adams, an achievement Dan Bylsma has done. 3rd Place on the list Boudreau has no Cup. Babcock has one Stanley Cup but no Jack Adams. In fact, since the year 2000, only Bylsma, Julien, and Torarella have won a Jack Adams and a Stanley Cup for the team they were currently coaching. That's quite an elite company. So I'm going to summarize since I think the audience that I'm trying to present these facts to may be overwhelmed with the amount of numbers and charts I've shown so far. 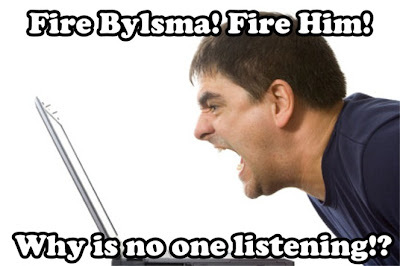 Another counter argument I've heard is the playoff track record of Bylsma is "embarrassing". Every goal in the Penguins lofty and fortunate position is the Stanley Cup. No arguments there. Every season the Penguins do not win the Cup its a huge disappointment. We have a roster stacked with talent and a paramount organization from the popcorn vendor to Lemieux and Burkle. Expecting the Stanley Cup every year is where we are as a fan base and we have a right to be. There is a strange reality that your favorite team does not win the Cup every year. If the Penguins suffer another first round exit this year - yes Bylsma's job is in jeopardy as it should be. General Manager, Ray Shero and management make it very clear that a Stanley Cup is out perennial goal. The reactionary movement to can our head coach RIGHT NOW is absurd. There are hundreds of things happen behind closed doors, and even the fans that watch every game on TV simply do not know all the intricacies of an NHL franchise. I know you have all the offensive and defensive schemes on NHL13 memorized and that you play Dek Hockey on the weekends but it hardly qualifies your opinion as an infallible truth. They asked NHL players in an anonymous poll in 2011-12 about which coach THEY want to play for.I don't know what else to say. Those are from the people who play the game. 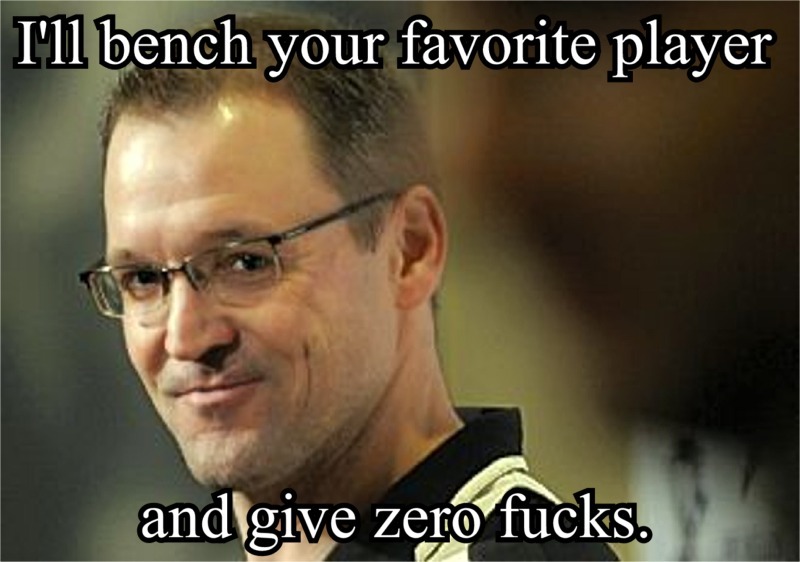 So Bylsma has won with the Penguins. He has been recognized as the best at his job in 2011. The people whose opinions are weighted more heavily than social media (the players) would like to play for him more than any other coach in the NHL, I'm not sure what fraction of an argument is left? I'm sure you'll find something right? I was going to go over possible replacements for Dan Bylsma but I don't see a point. YOU are awesome! You speak the truth! Hmm. A team built to win the Lord Stanley's cup, and they struggle against the New York Islanders; this team made the playoffs only because of shoot-outs otherwise they would be sitting in 10th place. A team where the players appear confused and unsure of what to do except the stretch pass that won't work. No adjustments by the head coach. 2012 the Pens lose to Montreal, 8th seed, in 7 in the second round. Lose to Tampa in the first round in 2011 and Philadelphia in 2012 in the first round. They struggle with a 8th seed team and Dan should stay?? He may be a nice guy, but this is business and it is his time to leave. Throw MAF out, too. Hi, I'm Diane C. Brown. Thanks for details sharing. I am appreciated to read your post.